Stockings, a Healthy and Humbling Holiday Tradition! Yesterday morning I celebrated the holidays by opening up my stocking, a great custom that turns out to be one of the few healthy traditions I have practiced over the last few days! Yeah, something I should work on, but the “eggnog” and homemade cookies are hard to pass up! Each year the toe of my stocking is filled with assorted nuts in their shell and a perfectly ripe navel orange. For me, the tradition of nuts and fruit go back to when my grandparent placed these items in my stocking when I was young. And, each year I would question why I received these healthy snacks instead of more candy, with the annual response that these items brought good luck for the new year. Well, as I pealed my orange yesterday morning, my curiosity forced me to confirm this answer, or find the truth! What I found was a great history of giving, and a humbling path back to the past that will keep me placing fruit and nuts in the stockings of my loved ones. Giving fruit and nuts goes back to the 1880’s, as stockings became a popular way to give gifts during the holidays (learn why stockings were originally hung with care). During this time, these items where hard to acquire as times were tough, but the new railway systems made it possible to deliver fresh fruit before it spoiled. Thus, an orange and nuts were considered cherished treats! For all but the wealthy, this Christmas gift was the only fresh fruit and nuts children would enjoy all winter and spring. So, for those of you looking for healthy traditions during the holiday season, here is a practice that will not only provide good nutrition, but a story that will bring your family to appreciate the gifts received during this season. And, if you still need a little extra reason, I will tell you it brings good luck for the new year! 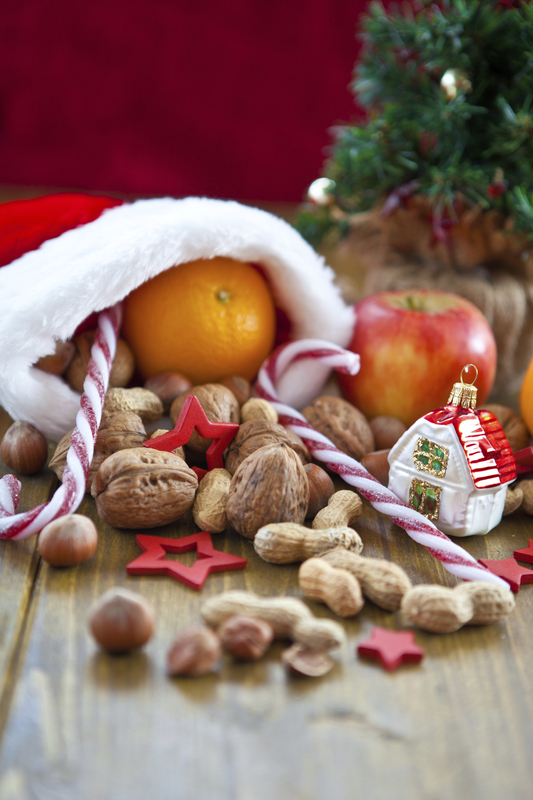 Looking for more healthy holiday traditions? Try these delicious recipes for Sweet Potato Casserole and Cranberry Apple Crisp! Yum! Let the Holidays Move You!